Samsung Galaxy Y S5360 runs on Android v2.3 (Gingerbread), an operating system (OS) that is capable of tethering or sharing the phone's Internet connection with other devices over a wireless LAN (Wi-Fi). So if you are subscribed to an unlimited internet connection and wants to make it "sulit", then share it using your Galaxy Y, and enjoy 3G download speed up to 7.2 Mbps via HSDPA (well, still depends on telco carrier and your location). 4. You can also set a password to secure your internet connection. 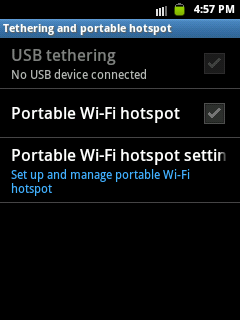 Select portable Wi-Fi hotspot >> The Configure Wi-Fi hotspot. 5. Then Select WPA2 PSK option >> then set your desired password. Press Save. 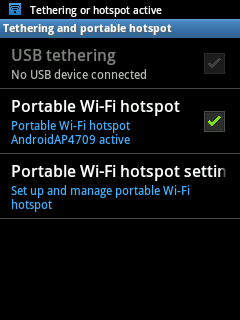 Tethering is also available on mobile phones or devices running on Android starting on version 2.2 (Froyo). 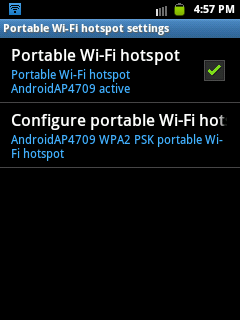 I have already tried it on Huawei Ideos that runs on Android 2.2 (Froyo). Just a tip: in order to save your device battery power, see to it that you turn off the Portable Wi-Fi router if you are not using or sharing it. Enjoy! Which will be the source of internet?? still the phone connected to wifi?? i can't get it!